I had a really nice Father’s Day this year. Woke up around 8am, had a shower, grabbed breakfast and sat down at my computer. Not too much later Rory and Chris woke up, came through and said “Mom’s not up yet but here’s your gift from all of us.”, whereupon Rory produced a bottle of Johnny Walker Black Label from behind his back. Yum, and with me being such a heavy drinker that should last me well into next year. 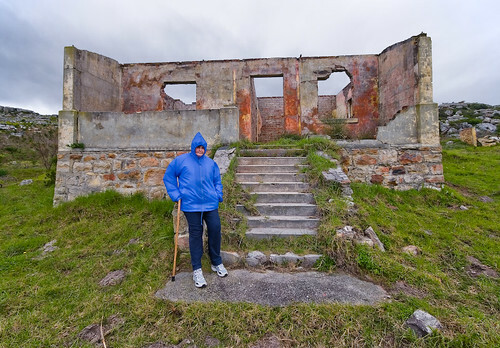 Mela and I went for a drive over to Simonstown to check out some ruined houses I’d heard about. I thought they might make a good location for shooting with a model or two and I wanted to see it for myself. They do look promising so now I must line up a model or two, put in an order for good weather on some weekend and go for it. After leaving there we drove down the other side of the peninsula to Scarborough and along the coast road round the point, back to Simonstown where we stopped for a late lunch. It had started spitting before we got there and we had just sat down outside the coffee shop when the rain came bucketing down so we dashed inside and had our lunch in the warmth while watching the rain come down outside. After lunch we headed back home again and just chilled for the evening. All in all a pretty cool day.